Hamburg is known as the gateway to the world and is the home port of Hamburger Hafen und Logistik AG (HHLA). 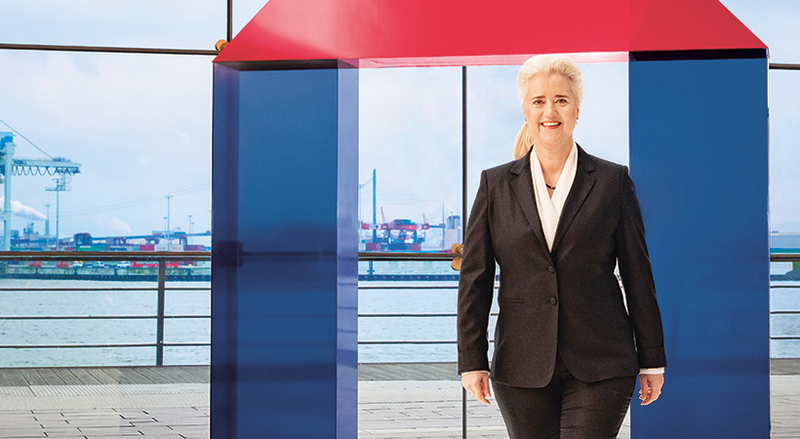 Just as Hamburg brings the world to the Hanseatic city, we work with our customers on shaping the world of tomorrow. We connect places, companies and people in order to exchange information and develop new concepts. The future is what drives us and regeneration is our constant companion. This is what we mean when we say that HHLA is the gateway to the future. This claim isn’t restricted to our overarching objective of achieving success as one of Europe’s leading port logistics and transportation companies. For us, shaping the future also always means taking a responsible approach to our use of natural resources. Our sustainable business model has already been highly successful, as our nomination for the 2018 German Sustainability Award confirmed. For the implementation of our sustainability strategy, we focus on ten key areas of action. These areas combine successful business practices with environmental requirements and social responsibility. An environmentally responsible approach to logistics, now and in the future, must focus on transferring more cargo from road to rail. We also regard this as a suitable way of mastering the environmental challenges of international supply chains. HHLA therefore supports the initiative launched by European railway companies to significantly increase the proportion of cargo transported by rail by 2030. This target, published last year at the climate summit in Katowice, will help to reduce the impact of traffic on our climate. It is also in line with the targets of the Paris Agreement. In the years up to 2022, HHLA will provide its rail subsidiary Metrans with € 350 million of funds to invest in modern terminal facilities, locomotives and its fleet of wagons. In the reporting year, Metrans already put its 40th eco-friendly, multi-system electric locomotive and further quiet container wagons into operation. With more of its own locomotives, Metrans will be able to manage its transport processes even better, thus enabling us to offer our customers even more attractive and comprehensive services. The further increase in transport volumes for our railway company makes a significant contribution to HHLA’s positive operating result while also reflecting our efforts to strengthen climate-friendly rail transport. The shift towards this more environmentally friendly mode of transport is supported by the operation of low-emission terminals. We are also integrating other parties into the optimisation of our logistics chains, such as the Hamburg Vessel Coordination Center (HVCC). As the central, neutral and industry-wide coordination point for mega-ship, feeder and inland vessel traffic in the Port of Hamburg, the HVCC offers terminals and shipping companies operational coordination services to optimise the emissions of arriving and departing ships. The number of companies using HVCC’s services increased once again during the financial year. The acquisition of Estonia’s largest terminal operator, Transiidikeskuse (HHLA TK), also complements our long-term sustainability strategy. Due to regional infrastructure projects (such as the Rail Baltica project), this site is developing into a multimodal hub and broadening the foundations of our business. The joint venture established with US research and development company Hyperloop Transportation Technologies (HTT) for the development and sale of a hyperloop transportation system for shipping containers is a further step towards relieving the strain on transport infrastructures by adopting innovative approaches. During the reporting year, we already achieved, and even exceeded, our ambitious climate protection goal of reducing CO2 emissions per container handled by at least 30 % by 2020 – based on our 2008 figures. With the ongoing electrification of diesel-powered equipment and facilities, improved processes and the use of electricity from renewable sources, we have now reduced our emissions by 31.7 %. During the reporting year, we further intensified our efforts to achieve the requirements for full electrification of the automated guided vehicles (AGVs) used for horizontal transport at the Container Terminal Altenwerder (CTA). This means that a significant proportion of horizontal container transport at the terminal is now emission-free at the point of use. We continued to drive the conversion of vehicles used at our terminals to electric technology. During the reporting year, 81 cars were already being operated with purely electric drive systems, five with hybrid drive systems and one vehicle that is fuelled by hydrogen. Charging stations were set up in several company car parks for private electric cars. This means that our employees can also charge their e-vehicles during working hours. We also go to great lengths to protect the health and well-being of our staff and the employees of external companies. Working conditions are subject to ongoing scrutiny and adapted where necessary. Our social commitment focuses on schoolchildren. The maritime education projects supported by HHLA all have a strong connection with environmental and sustainability topics. In 2018, more than 1,400 schoolchildren were educated by projects such as these. With the successful recertification of our energy management system according to the DIN EN ISO 50001 standard, the results of our measures to boost energy efficiency were confirmed in 2018. With the efficient use of energy, which is one of the key pillars of the energy transition, we are able to make an effective and measurable contribution towards reducing CO2 emissions. The scope of application of the certified energy management system includes all German and Polish companies with significant energy consumption. In 2018, we successfully raised our already high added value ratio by 8.5 % to € 676 million in 2018. This key indicator reflects the significant economic added value of our business activities at all of our locations. Highly skilled, satisfied and motivated specialist staff and managers are one of HHLA’s key factors for success. Investments in varied and attractive social benefits, extensive options for education and training, and numerous ways to optimise their work-life balance all increase the loyalty and motivation of our employees. With measures to protect and promote health, as well as occupational safety, we take our social responsibility very seriously. Since a significant proportion of our staff carry out tasks that are physically demanding, high occupational safety standards and the active promotion of good health greatly contribute towards counteracting the effects of demographic change in the company. We actively promote the establishment of agile structures by forming cross-functional teams. Diversity criteria are anchored within our strategic HR management with corresponding targets. HHLA is an attractive employer. This is reflected in the strong interest among young people to do an apprenticeship at HHLA, in the many years that our staff spend with the company, and in our increasing headcount. We want to continue to belong to those elite German corporations whose sustainability efforts are recognised by independent experts. For this reason, we will continue to steadily enhance our sustainable business model. A fully automatic, driverless transport vehicle which carries containers back and forth between the container gantry cranes on the quayside and the block storage yard at the HHLA Container Terminal Altenwerder.